Late Saturday night Kate and I returned from Jackson Hole, Wyoming, where we had rented a house to celebrate our 50th anniversary with our children and grandchildren. Everyone was able to be there which is a very rare event. In fact, this is the first time all of us have been together for a full week. I am glad to report that it went swimmingly well – at least from our standpoint. I also believe the others had a great time as well. I thought that Kate got along well. I suspect that no one may have been suspicious about her Alzheimers. She is more withdrawn than she used to be and did not pretend to help in the kitchen which could have been a clue. I guess I will find out when the day finally comes that we make it known to them. It would not surprise me that when that happens they will have already been suspicious. This has made me reflect once again on the timing of telling them. From Kate’s standpoint, she would just as soon never tell. They would simply realize what was happening the same way it happened with Mom. On the other hand, I had definitely decided that it is best that I have known all along because it has meant that I have taken advantage of our time together. I wouldn’t give anything for this time. We have been very conscious and deliberate about making the most of our time. The interesting thing is that despite Kate’s own frustrations over having AD, she thinks she will have more time than I believe she will have. By the way, she commented on how caring Jesse and Greg were during the week. She wondered if I might not have told them. I told her that I hadn’t said a word. I think they were responding to the nature of the hiking trails we were on. We all noticed that she is less stable. They also know that she is geographically challenged. Kate was quite careful to ask me for help when she needed something. For example, she didn’t know where any of the kitchen utensils were kept; so when she fixed her cereal in the morning she needed help identifying the right drawer. She asked me discretely, and I don’t think anyone noticed. One reason I don’t think people noticed is that no one has said anything to me. If they know, surely they would say something to me. I will write more later when I have a moment. I want to comment on the grandchildren and the letters I had for her. I believe I mentioned that we have replaced Kate’s ATM card several times over the past year , three times since Jan 1, I believe. A few days ago, I gave her a leather card holder that I had used in the past to carry my business cards. I put her driver’s license, ATM card, Medicare card, and supplemental insurance card in it. Yesterday afternoon she told me that she couldn’t find it. This morning she let me know that she has gone through all her purses and looked in all the places she thought it might be without success. I looked in the car and around our bedroom and laundry room. Still no luck. I told her we would look for it later. I also told her we could use her passport when we travel to Jackson Hole on Wednesday. In addition, I suggested that we put the new cards in the glove compartment of her car and that we leave them there. Of course, I stopped short of saying what I think is coming – that I take all her cards and hold them for her. This past Friday we celebrated our 50th anniversary. I spent most of the day with Kate, and we went out to dinner that evening. This entire week we have reflected on the things we have experienced together. Our relationship continues to be special. Although it has always been good, it has taken on a different nature since Kate’s diagnosis. As I expressed before, I wish that I had been able to respond to her before the diagnosis the way I have since. I have been significantly more understanding and , thus, accepting. Many little things that annoyed me before (for example, the way she loads the dishwasher) I simply accept now. 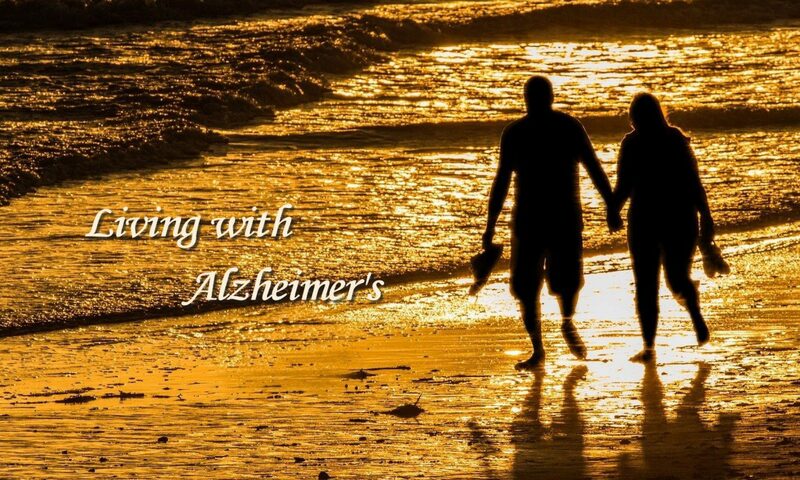 This is also to underscore that many of the things that I attribute to Alzheimer’s are things that were manifest earlier. They are just significantly worse now. One example would be the fact that when she opens a pack of sugar substitute, she leaves it on the counter rather than putting it in the trash which is immediately below where she dropped it. I continue to observe that she accepts her dependence on me. She wants me to help her with most of her tasks (PEO, neighborhood, calls to people, etc.). I acknowledge that this puts some degree of stress on me, but it is quite manageable right now. I know the future will be different. Adding to this is care for Dad. He celebrates his 100th birthday on Oct. 19. We begin to act as though he will live forever. While I know this is not so, he could live long enough to complicate my care for both of them. I suspect, however, that it will work out. By that I mean that he will pass away before Kate reaches a point at which she requires constant attention.